Short Stories to chill you to the BONE! 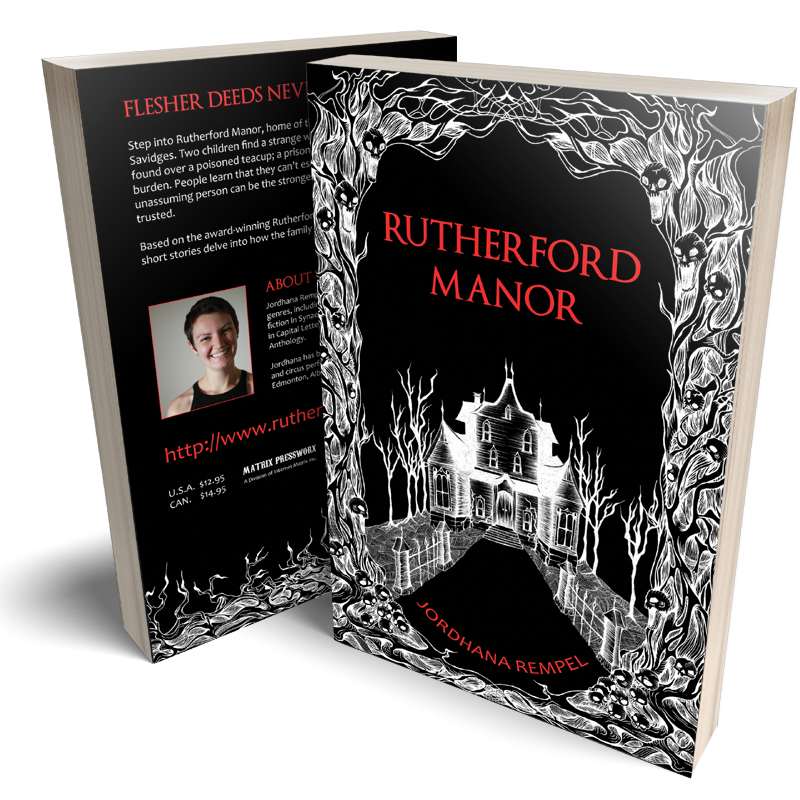 Step into Rutherford Manor, home of the ruthless Fleshers and cunning Savidges. Two children find a strange woman living in the attic; love is found over a poisoned teacup; a prisoner wakes up with an unexpected burden. People learn that they can’t escape their past, that the most unassuming person can be the strongest ally, and that owls are not to be trusted. The complex characters of Rutherford Manor come to life in six short stories based on the multiple award-winning Rutherford Manor Haunt characters, concepts, history, and stories developed by Rutherford Manor Universe creator Preston Ewasiuk, and Haunt creators Hugh Flesher and Therese Hansell. Jordhana Rempel retells these compelling and chilling stories in this book of truly gruesome proportions which includes a new tale for gory thriller fans. Pick up a hardcopy of Rutherford Manor – Short Stories for your horror library. These books are beautifully printed and are awesome coffee table fun! There are a limited number of these so pick them up before they are gone! Please use the below Pay Pal button to order a copy of the Rutherford Manor Book if you live in Canada. Price includes $14.95 CDN for the book, $7.00 Shipping / Handling and GST. Please use the below Pay Pal button to order a copy of the Rutherford Manor Book if you live in the United States. Price includes $14.95 CDN for the book plus shipping and handling. Please use the below Pay Pal button to order a copy of the Rutherford Manor Book if you live in outside of Canada or the US. Price includes $14.95 CDN for the book plus shipping and handling.